The story starts off with a bang in the very first chapter, pulling you in to see if Suzanne can find the killer who brutally murdered a well-respected, elderly dairy farmer. I loved it. I loved meeting the characters. I loved the small town feel which makes a great cozy. I absolutely love all of the books that I have read by author Laura Childs. 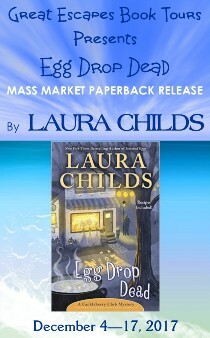 I am sure that this new book called “Egg Drop Dead” which is part of the Cackleberry Club Mystery series will be one that all readers will also enjoy. The fast pace begins with the first page and doesn’t end until the explosive conclusion. This series has been on my list for a long time. I randomly own the third in the series which is so unlike me because I’m OCD about reading series in order. Still on the hunt for the first one. I love this series! Cannot wait to read it! 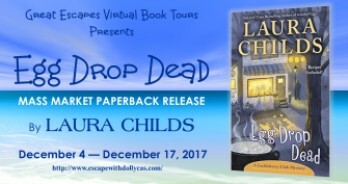 Thank you for the Synopsis of Egg Drop Dead (A Cackleberry Club Mystery) and the information about the author, Laura Childs. I’d love to read this book as are her other books. I love everything Laura Childs writes. This looks amazing! I’m ready to visit the Cackleberry Club café! All these different excellent mystery series! It’s amazing! This looks like such a fun read! Can’t wait! Thank you for the great giveaway!